When you were campaigning for the presidency in Bluffton, South Carolina, on February 15, 2016, you told voters that under your watch they would “find out who really knocked down the World Trade Center.” And so we implore you, while you are now involved in exposing FBI corruption, to also investigate the agency’s reluctance to examine the explosive destruction of the three World Trade Center skyscrapers—namely, Buildings 1, 2, and 7—on September 11, 2001. As you know, the events of that day are responsible for much of the worldwide carnage that continues to this day. Thus, 9/11 remains an issue of grave importance to the United States of America. I’m Richard Gage, a San Francisco Bay Area architect of 30 years, member of the American Institute of Architects (AIA), and one of 3,000 members of the non-profit organization Architects & Engineers for 9/11 Truth, which I founded in 2006. The FBI has been made aware of the gross inadequacies of the investigations into 9/11 that have been carried out over the past seventeen years by various official entities, including the Federal Emergency Management Agency (FEMA), the National Institute of Standards and Technology (NIST), and the 9/11 Commission. Yet ten years later, here we are, still with no credible WTC investigation—only a series of missteps and misstatements by FEMA and NIST, which we have documented in our 50-page booklet Beyond Misinformation: What Science Says About the Destruction of World Trade Center Buildings 1, 2, and 7. When obtaining licensure, architects and engineers commit themselves to upholding their respective profession’s code of ethics. The 3,000 architects and engineers with whom I work are meeting this ethical obligation regarding 9/11: They are challenging the false assumptions and lies that have created an endless “post-9/11 era,” in which $5.6 trillion has been spent by the U.S. government on waging wars and implementing unconstitutional policies. How did the elevated building mass of the upper section of each Twin Tower (Buildings 1 and 2) destroy the 80,000 tons of structural steel at nearly free-fall speed, as if the steel framing weren’t even there? Given that open-air jet fuel fires burn at only about 600° F. (per manufacturers specifications) and that normal office fires burn at only 1,500° F or so and that the melting point of steel is above 2,700° F, what thermal energy source could have produced the several tons of molten metal observed flowing out of the South Tower shortly before its collapse? This lava-like flow of metal was also seen under the rubble for weeks in the aftermath of the Twin Towers and Building 7 destruction by numerous witnesses—even by the World Trade Center’s structural engineer, Leslie Robertson. What explains the chemical evidence of thermite, an incendiary material found on the ends of steel beams and in pools of molten iron in the World Trade Center debris? In Appendix C of its BPAT Report, FEMA documented “evidence of a severe high temperature corrosion attack on the steel, including oxidation and sulfidation with subsequent intergranular melting.” This is clearly not a feature of gravitational collapse, of hydrocarbon fuel, or of normal office fires. Yet NIST summarily dismissed this key evidence when its engineers took over the investigation from FEMA. What is the source of the billions of previously molten iron microspheres, which are well-documented in samples of the World Trade Center dust? Both the United States Geological Survey (USGS), in its “Particle Atlas of World Trade Center Dust Report,” and engineering consulting firm RJ Lee Group, Inc., in its December 2003 “WTC Dust Signature Report: Composition and Morphology,” document these once-molten droplets of iron. But neither of them explains how these microspheres got there! Importantly, the microspheres contain the chemical signature of thermite, an incendiary material used by the military to cut swiftly and cleanly through structural steel. Why did Building 7, the third WTC high-rise to collapse, descend at free-fall acceleration during its seven-second collapse? Video analysis shows the upper portion of the steel-framed structure accelerating at the maximum rate of gravity. Even NIST acknowledged this can only mean one thing: The structure below offered “no resistance.” And the only possible way there was no resistance, according to the laws of physics, is that the structure was “removed.” What removed it? What mechanism can account for the simultaneous failure of the critical number and distribution of columns required to produce this rate-of-gravity acceleration? NIST now attributes the catastrophic collapse of Building 7 to a new phenomenon called “thermal expansion” due to “normal office fires”—with little or no contribution from falling debris or from diesel fuel. Based on this outlandish claim by NIST, are we to suddenly accept that our understanding of fire science, building materials, and structural behavior has been deeply flawed all along? If so, then why has the International Conference of Building Officials (ICBO) steadfastly resisted all proposed post-9/11 changes to structural building codes? 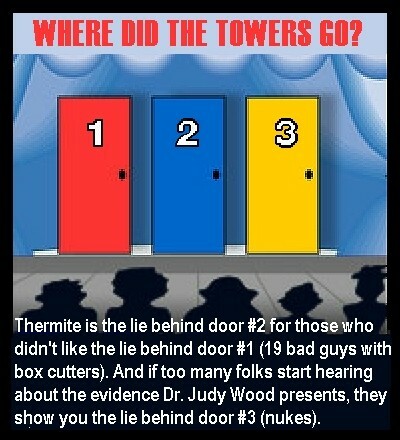 On the subject of Building 7, please read the potent five-minute executive summary testimony by AE911Truth, titled Undisputed Facts Point to the Controlled Demolition of WTC 7 and delivered to NIST on a December 18, 2007, teleconference call in response to NIST’s preposterous new theory. Then watch our fifteen-minute, made-for-PBS documentary on the destruction of WTC 7, narrated by actor Ed Asner. Why did more than 100 FDNY first responders describe, in great detail, the sounds of explosions and flashes of lightimmediately before and during each tower’s collapse? Why did we not know about these thousands of pages of FDNY “oral history” evidence until August of 2005—and only then after a court order mandated their release? FDNY’s own chief of safety, Albert Turi, and its top chief, Ray Downey (who is the “premiere collapse expert in the country,” according to a fellow chief), both spoke of the presence of explosives in the towers prior to their failures. Why were 118 FDNY testimonials that referred to multiple, violent explosions ignored and unreported by the 9/11 Commission and by NIST and FEMA? What was the energy source that pulverized 400,000 cubic yards of concrete into a fine powder in mid-air? Through what mechanism was the energy source applied? Why did that powder blanket lower Manhattan as each of the three buildings was collapsing? Calculations show that the energy requirement for this pulverization and the rapid expansion of the subsequent dust clouds was far greater than the available gravitational potential energy of the structures. This simple energy imbalance alone proves the official explanation impossible. Is this the same energy source that is responsible for the vaporization of more than 10,000 steel file cabinets and of 1,100 human bodies that were never found, not even the smallest traces of DNA? How were four-ton steel members ejected from the Twin Towers at 70 miles per hour and why did they land up to 600 feet away? A simple gravitational collapse would only allow up to 100 feet of “drift,” so what provided the energy required for them to travel six times that distance? Why were virtually no floors found at the base of either Twin Tower? There were originally 110 floors in each Tower—each of them one acre in size. What could explain the disappearance of a total of 220 acres of four-inch thick concrete floors (180,000 tons of concrete) and of each floor’s steel decking and trusses? What caused the explosive ejections of pulverized building materials that appeared as many as 60 stories below the rapidly descending “collapse” of each Tower? These “squibs,” readily visible in all of the publicly available videos, indicate that building materials were being ejected at a speed of more than 160 feet per second. Why does the seismic evidence collected by Columbia University’s Lamont Doherty Earth Observatory corroborate the evidence that supports the explosive demolition theory instead of the official collapse theory? Why did NIST refuse to test for residue of explosives, citing the nonsensical, unscientific rationale that such tests “would not necessarily have been conclusive”? Meanwhile, an international team of scientists found and documented nano-thermitic explosives residue in the World Trade Center dust. The National Fire Protection Association’s NFPA 921 document, “Guide for Fire and Explosion Investigations,” requires such testing when there is “high order damage,” as there obviously was at the World Trade Center. We have carefully documented all of the above evidence in our video documentary 9/11: Explosive Evidence—Experts Speak Out, which uses basic physics and simple, rational forensic inquiry to expose the fraudulent nature of the official explanation of the World Trade Center destruction. In addition, we have publicly presented the evidence of controlled demolition to audiences in well over one hundred U.S. cities and in dozens of foreign countries. The response at these presentations has been stunning. After hearing us recite the facts, at least eighty-five percent of attendees who initially believed the official story of “fire-weakened steel” change their minds, decide to support our theory of “explosive demolition with explosives/incendiaries,” and agree with our call for a new, independent investigation with subpoena power. The body of clear, scientific evidence that we present has been vetted, to one degree or another, by our more than 3,000 building professionals, as well as by hundreds of physicists, chemists, and other science-based experts who have signed our general petition. So compelling is the evidence that we were invited to be interviewed on C-SPAN’s Washington Journal. Since its airing in August 2014, our 40-minute interview has become the most-watched video on the entire C-SPAN website, with more than one million views. Mr. President, AE911Truth’s top representatives are prepared to come to Washington, D.C., to meet with you. We are determined to fulfill our patriotic duty to obtain justice for the 9/11 families and to ensure the future safety of our fellow Americans. We have the technical expertise to defend your demand for the truth about the criminal destruction of all three World Trade Center towers on September 11, 2001. Humbly, we offer ourselves in service to your mission to Make America Great Again. Richard Gage, AIA, is a San Francisco Bay Area architect of 28 years, a member of the American Institute of Architects, and the founder and CEO of Architects & Engineers for 9/11 Truth, a 501(c)(3)educational charity. In his architectural career, Gage designed most types of building construction, including numerous fire-proofed, steel-framed buildings. Most recently, he worked on the construction documents for a $400M mixed-use urban project with 1.2 million square feet of retail and 320,000 square feet of mid-rise office space, plus a parking structure, totalingsome 1,200 tons of steel framing. Gage has delivered his live multimedia presentation 9/11: Blueprint for Truth more than 500 times in 37 foreign countries and 110 American cities to audiences ranging in size from 30 to 3,000. He has appeared in more than 550 radio and television spots. Phi Beta Iota: A&E911Truth has earned over 3,000 signatures from those with verified academic degrees and professional licenses, and an additional 20,000 non-architects and engineers, all calling for a new, independent investigation–with full supoena power–into the September 11, 2001 destructions of the World Trade Center Buildings, 1, 2, and 7. A&E911Truth has not focused on and takes on position on the Pentagon or the Shanksville, PA aspects of 9/11. A&E911Truth disputes the no planes, nuclear, and directed energy weapons theories; as others dispute their exclusive focus on thermite. Any independent investigation must consider all possibilities together. Both the super-duper thermite gang 👥 and the super-duper nuclear gang 👥 are covering up the lack of high heat 🔥 when a careful observation of all the evidence concludes that the destruction was cold molecular disassociation produced by a type of directed energy. There is also the CGI/Remote controlled plane coverup gangs 👥 – when it was actually image projection of some kind. There are also gangs 👥 that coverup both lack of high heat and image projection technology.